Home › Home and Kitchen › Grill Armor 932F Extreme Heat Resistant Oven Gloves - En407 Certified Bbq Glo.. Size: One Size Fits Most | Color: Grey Comfortable, Flexible Oven and Grill Gloves Offer the Ultimate in Heat & Flame Protection! Too many people suffer burns when cooking on a barbecue grill, in the oven ormicrowave, on the stove or over an open fire. Don't let that happen to you! Our Grill Armor Gloves offer the highest protection up to 932F and are EN407 Certified, yet are also comfortable and easy to use. You get: Two gloves instead of one oven mitt which makes carrying hot dishes andplates much easier Silicone super-grip surface on each glove to prevent anything slipping fromyour grasp and leaving the meal you worked so hard to create lying on thefloor or ground Five finger design for flexibility and easier grasping of cooking and grilltools These oven gloves are also extremely easy to clean, just drop them in thewashing machine! Now you don't have to worry about suffering painful burns around hot grills orovens. 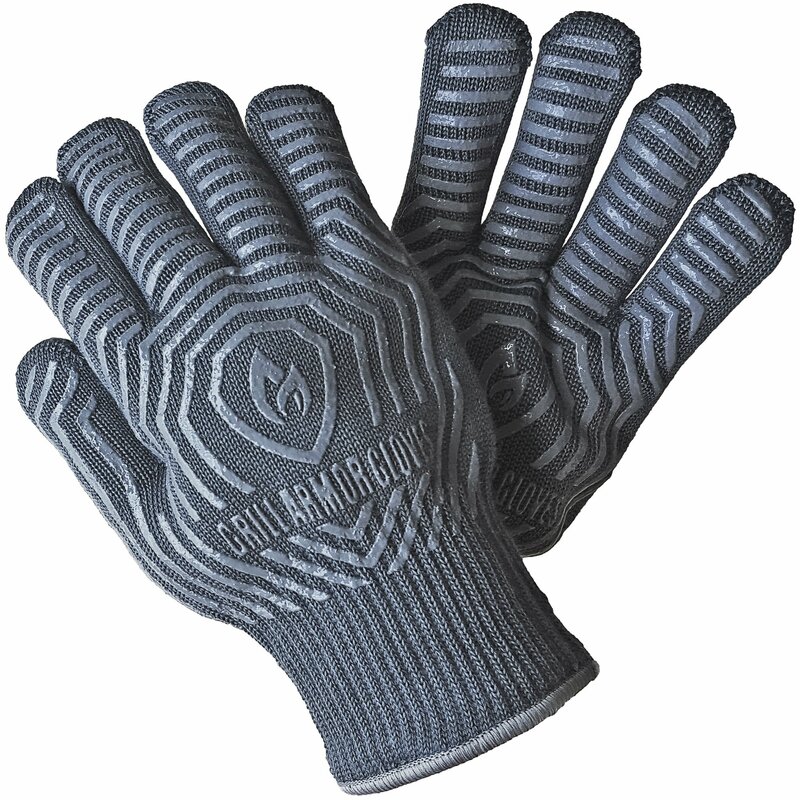 Grill Armor Gloves are heat and flame resistant - keeping your hands safewhile also being comfortable and easy to use. To get your grill gloves today, just click on the add to cart button on thispage Hurry, Take advantage of our 100% Lifetime Money Back Guarantee. If for any reason you're not completely satisfied, return your gloves for a NoQuestions Asked Full Refund.